The Toronto Star's John Spears has a feel-good story in "Ontario’s power grid handling heat with ease." Eight years ago, almost to the day, Terry Young was warning Ontario that a heat wave gripping the province could force rolling blackouts. But this week, with the city again broiling, Young was issuing no such dire warnings. Simply put, there’s more supply and less demand, said Young, now vice president of the IESO. Young noted that the current figures slightly understate consumption, because they don’t capture the output from wind and solar facilities that feed power directly into local systems. That adds about 1,000 megawatts of supply, he said – about 700 megawatts of which is solar, which has been producing at a high level for much of the past few days. I located the public appeal issued by Young's IESO eight years ago (to the day ... but it was a Monday in 2005), and then I pulled the figures for Monday-Wednesday of the week in 2005 to compare the demand shape to the most recent 3 days this year. I was expecting to see lower daytime demand in 2013 shown as the inverse of what would be an expected output from ~1000MW of solar capacity. But I didn't expect to see the dramatic shift to late-day demand. There could be a number of factors resulting in this apparent shift. Solar output shows only as negative demand in Ontario - maybe the afternoon demand is 700MW, or more, higher than indicated. The Class A global adjustment, which provides an enormous incentive for Ontario's largest users to curtail use during the 5 daily maximum demand hours, may be partially responsible. In 2005 these hours were most likely to occur during hour 16, but it seems this may be moving to hour 17 if one goes by the IESO's reported demand - but... the Class A customer won't know which hours the IESO considers the top 5 for a number of weeks, and then the IESO will track the embedded generation for the top 5 hours in order to calculate the Class A client's share of the global adjustment. It is unlikely the top 5 demand hours established by the IESO will be the actual top 5 demand hours in Ontario - because they don't have a handle on embedded generation. The Class A customer may also be responsible for some of the night-time growth in demand. A recent Ontario Energy Board Market Surveillance Panel report indicated Class A customers were load shifting to "off-peak hours", but their definition of "off-peak" may not be the market definition, but the government definition set in it's regulated time-of-use (TOU) pricing plan. The demand change starts to grow in hour 19 coinciding with "off-peak" pricing starting at 7 pm. Some of the evening growth may therefore be due to class A customers making up for the idled time in the afternoon, some by consumers turning on every appliance at once, and some from the hidden production of solar disappearing (and thus allowing the demand that had always been there to show). It's important to note this graph will probably be amplified if we have a week of comparable heat next year, because solar may have grown to 2000MW of capacity by then. 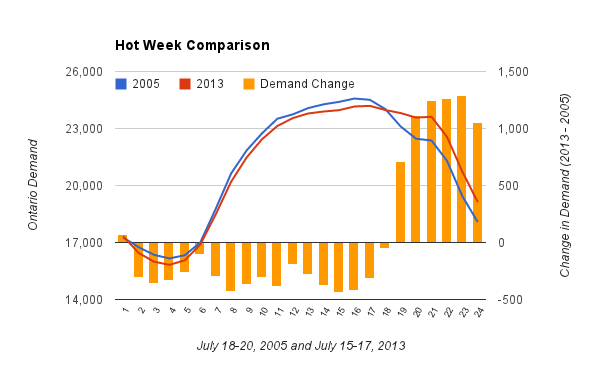 It's also important to note that the difference in demand at 9 pm and demand at 4 pm has, on these hot weeks, shrunk from about 2200MW in 2005 to about 540MW in 2013 - so solar changes may, if not by next year then by the one after that, push the "Ontario Demand" peak to sunset. It's also notable that the IESO is pursuing the expansion of the class A global adjustment program to include smaller businesses (and, I suspect, much of the MUSH sector). It would probably be wise to figure out how much embedded generation we are purchasing and when. It would also probably be a good idea to report demand as demand - not as the sum of the generation directly connect to the IESO controlled grid - these generators are providing increasingly less of Ontario's total supply. Ontario's net exports grew, in this comparison, by an average of approximately 1800MW. The growth in Ontario's ability to meet the highest demand periods might be explained by the addition of new generation (as the article in the Star does). The ability to meet peak demand during the hot spell could be attributed to old generators; specifically the decisions cancelling the phase-out of coal planned for 2007: at the highest IESO Ontario demand peak of 2013, the 6 coal units in southwestern Ontario, all slated for closure at the end of 2013, were basically running flat out in producing 2627MW. Ontario's supply situation is healthy.